The lovely Vanessa of Lella Boutique curated our November box. She chose to include: 1. 5 Fat Quarters of her Farmer's Daughter fabric. 2. 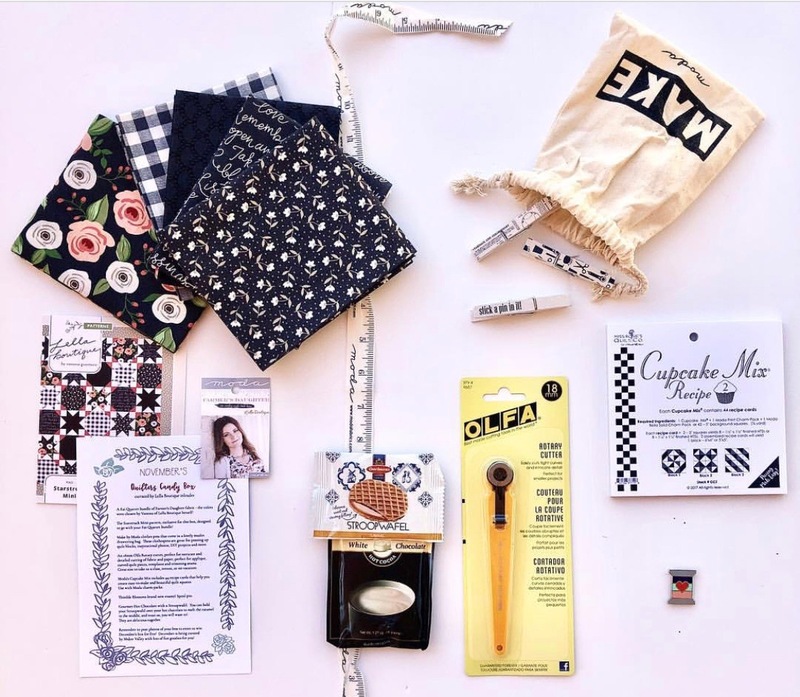 She designed an exclusive pattern, Starstruck Mini, for our box. 3. Vanessa loves her 18mm Olfa cutter for smaller cutting and details, so we included one. 4. The Black and White Moda decorative pins were a perfect match for this box. 5. Moda's Cupcake Mix Recipe was a fun addition and a great way to easily make a quick quilting project. 6. We included one of Thimble Blossom's new enamel pins, her Spools pin. Perfect for starting or adding to a collection. 7. For a treat, what is better than Stephen's White Chocolate Hot coco along with a Dutch Stroopwaffle. Mmmm!